Pneumadyne is committed to developing pneumatic products that fit a variety of fluid handling requirements. Whether we are introducing a new line of barbed fittings or directional control valves, you’ll find the most current Product Announcements here on our What’s New page. We recently expanded our Air Jet Base offering to make it even easier to include Pneumadyne Air Jets in your circuit. Our new Base with 1/8 NPT threads is recommended for direct connection in a manifold or valve port. 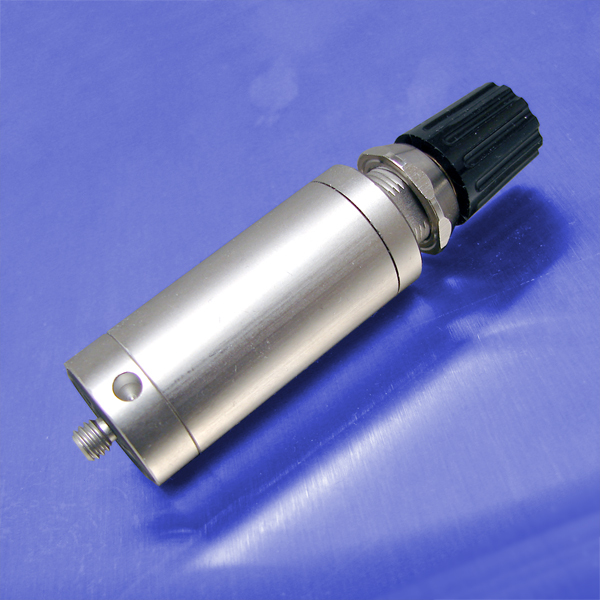 The .25Ø of our Push-in style base was designed for use with 1/4 OD push-to-connect ports; ideal for installation in the output port of Pneumadyne's "11" Series control valves. Pneumadyne’s new Pilot Operated Check Valves are ideal for reliably holding an actuator position in a variety of applications. These rugged valves feature a 1/4 or 1/8 NPT output port which mounts directly on a cylinder, minimizing space requirements and easing installation. 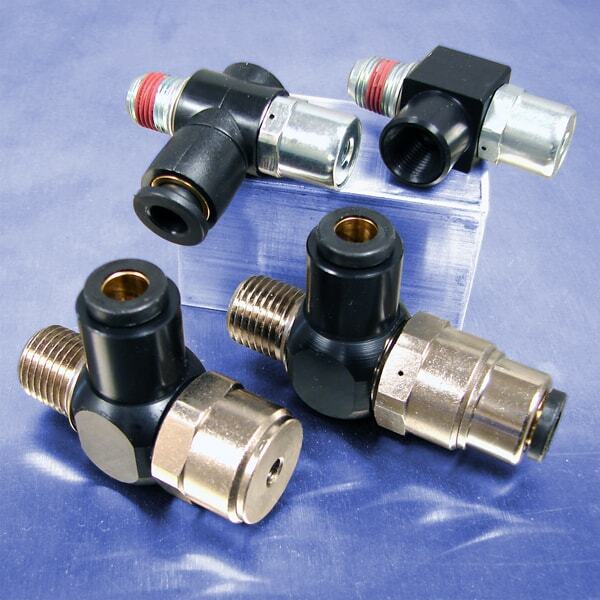 The input port swivels to accommodate valve alignment and contains a 1/4 push-in or 1/8 NPT (F) connection to speed tubing installation. With a maximum operating pressure of 150 psi, these valves provide flow rates up to 22 scfm at 100 psi. 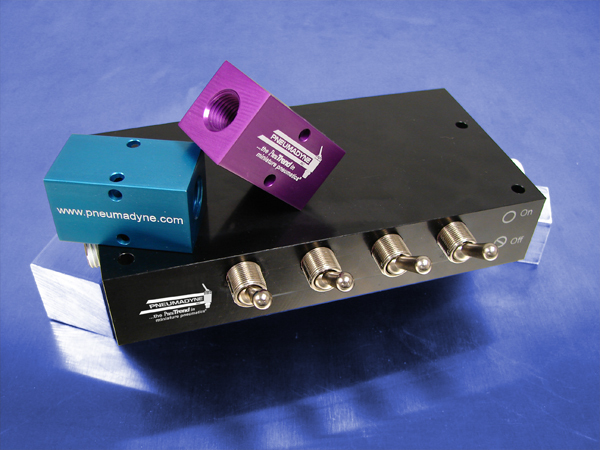 Pneumadyne’s new Miniature Precision Regulator offers highly accurate air pressure control in a compact package; ideal for limited space applications. This precision machined, high quality regulator features an output pressure range up to 100 psi and high flow rate of 4.5 scfm. With a maximum supply pressure of 250 psi, our Precision Regulator is extremely dependable and repeatedly returns to the set pressure when turned off and on. Exceptionally tight design tolerances effectively minimize vibration allowing the regulator to remain stable under changing operations. Pneumadyne’s Pilot Operated Cartridge valves offer a high flow rate in a compact package. Designed for integration in a pneumatic circuit’s valve block, these .250 inch and .500 inch orifice valves can be used as either a 2-Way or 3-Way function. Our exclusive PneuTef™ plating process results in a smooth, slippery finish which extends product life and also allows the valves to be used in both lubricated and non-lubricated air applications. Our new 2-Position Valves are ideal for use in rugged applications. The combination of the solid aluminum body and stainless steel toggle provides the strength needed to withstand harsh conditions. These 2-Way & 3-Way valves feature 1/8 NPT (F) ports and provide a flow rate of 41 scfm at 125 psi. 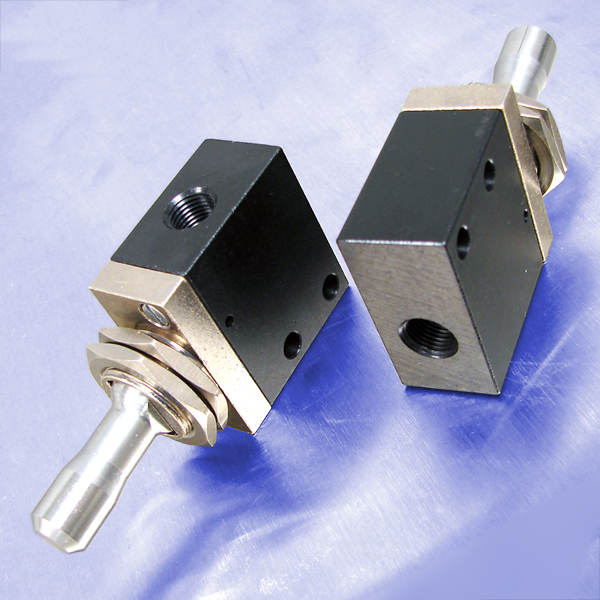 Both detented and momentary toggles are offered to fit actuation requirements. For extreme environments, heavy duty toggles are also available. 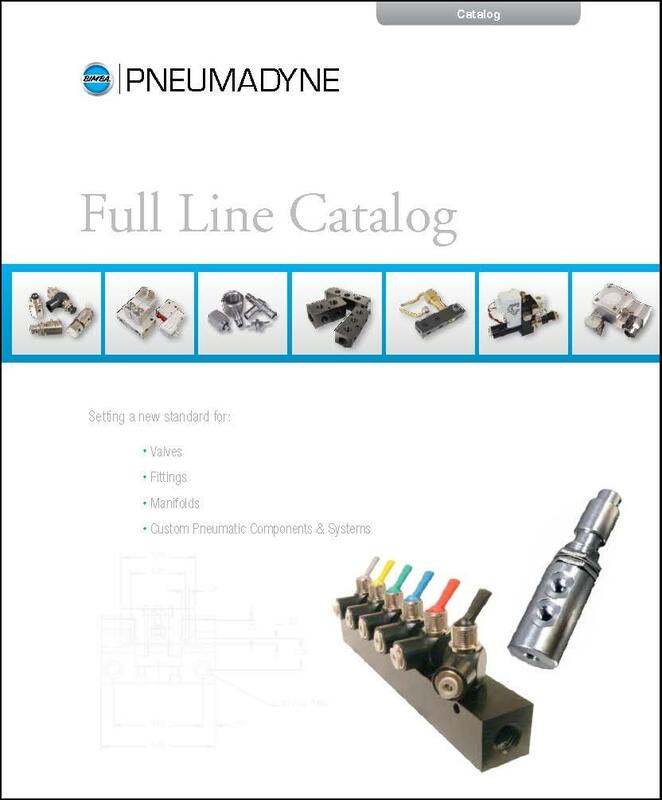 Pneumadyne's new Full Line catalog is now available. This 238-page catalog provides details on all of Pneumadyne's standard pneumatic components and includes images, technical drawings, performance data, product features and ordering information. Custom product applications are also featured. Pneumadyne is your source for fluid handling components. Request your free copy of our new catalog today! Bimba Announces Acquisition of Pneumadyne, Inc.
University Park, IL - August 1, 2012 - Bimba Manufacturing Company, an industry leading provider of pneumatic, hydraulic and electric solutions, today announced the completion of its acquisition of Pneumadyne, Inc. Headquartered in Plymouth, MN, Pneumadyne has been an innovative manufacturer of pneumatic components and control systems for over 35 years. 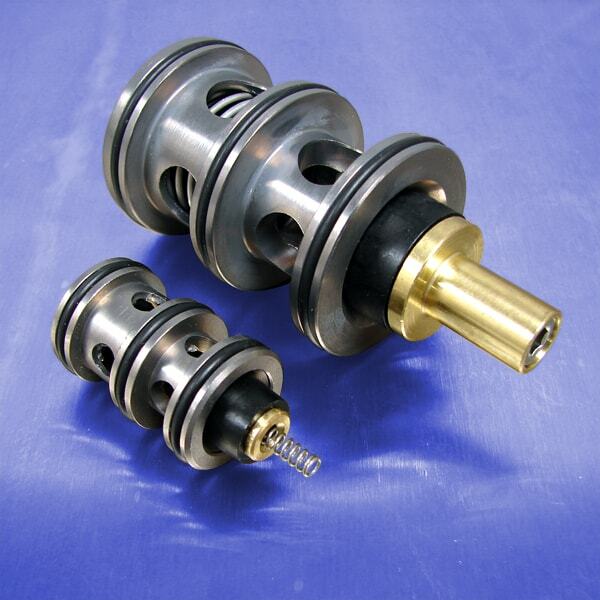 their products are used for fluid control by a wide variety of industries throughout the world. According to Pat Ormsby, President of Bimba, "This acquisition reflects Bimba's ongoing commitment to developing capabilities that address customer needs. Adding Pneumadyne's specialty products provides strategic value in our key industries and reflects our long-term commitment to growth. We fully expect this transaction will strengthen Bimba and complement our product offerings." Bimba Manufacturing is a forward-thinking innovator of actuation technology, specializing in providing cutting-edge solutions to engineering challenges. Including its brands, TRD, Mead and MFD, Bimba markets an extensive line of industry-leading products including pneumatic, hydraulic and electric actuators, valves, fittings, air preparation and a variety of safety and production solutions. In addition to its broad line of standard catalog products, the company's business develops many custom and semi-custom products designed for specific customers and applications. These products, used in machinery and automation, are sold to original equipment manufacturers and end-users throughout the world in an expanding variety of industries. For more information, visit bimba.com. Your logo or various symbology can now be laser engraved on pneumatic products manufactured by Pneumadyne. Our new laser engraving and vector cutting machine efficiently engraves detailed images and text on anodized aluminum, stainless steel and acrylic. Depending upon the material, we can also provide precision vector cutting up to ¼”. CAD, artwork and design services are available to assist in image development and to ensure that your information is accurately presented. 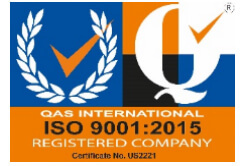 Pneumadyne’s Management Team is pleased to announce that we passed our annual ISO Audit without the issuance of a single non-conformance. 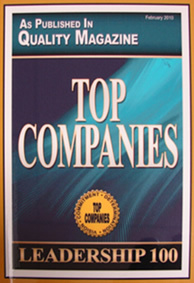 We take great pride in our quality system and our Quality Policy, Quality Through Continuous Improvement, is implemented throughout our entire organization. Our vision of quality not only applies to our products but also to the services that we provide, the people that we employ and the technology that we utilize.